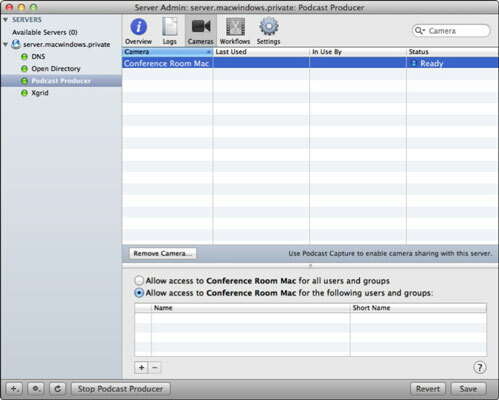 After Lion Server’s Podcast Producer is set up and running, you can add cameras and restrict access to them. The cameras are plugged into Mac OS X 10.6 or later computers on the network or are built-in cameras in Macs. Choose the Podcast Producer server when prompted and enter a username and password. Open Preferences from the Podcast Producer menu. Click the Audio/Video icon in the toolbar. Choose a Mac camera from the Video Source pop-up menu. Make sure that you see an image from the camera in the preview area. Choose an audio source from the Microphone pop-up menu and then click the Start Sharing button. Click the Start Sharing button in the dialog. In the dialog that appears, type the password for your server account and click the Modify Settings button. In the dialog that appears, enter a name for the camera, type your password once more, and click Start Sharing. You can do this for multiple cameras on a Mac and for multiple Macs. The cameras you add appear in Server Admin. Click the triangle next to your server in the left column to expand the list of services. Select Podcast Producer from the list and click the Cameras icon on the toolbar. Select a camera from the list. Select Allow Access to Camera Name for the Following Users and Groups. Click the Add (+) button to add users and groups to the list. You can re-enable all users to access a selected camera by selecting Allow Access to Camera Name for All Users and Groups.